Why is getting a premium-quality mattress so important? Why are mattresses named differently by different retailers? What to look out for when buying your perfect mattress? Premium mattress brands and how much do they cost typically? Where to buy branded mattresses at extremely cheap rates? How to go about shipping the mattresses? Is it worth it to ship a mattress? After a long day at work, all you really want is to fall into deep sleep once your head hits the pillow. But that’s the problem – you can’t seem to clock in the full 8 hours of sound, undisturbed shut-eye. According to sleep experts, comfort is the key to getting good sleep and factors such as posture, body weight and sleeping position should all be considered when purchasing your mattress. In fact, getting the perfect mattress would help to increase your focus and boost your day performance. On the flip side, health issues such as lower back and neck aches will arise if your mattress is sub-par at best. 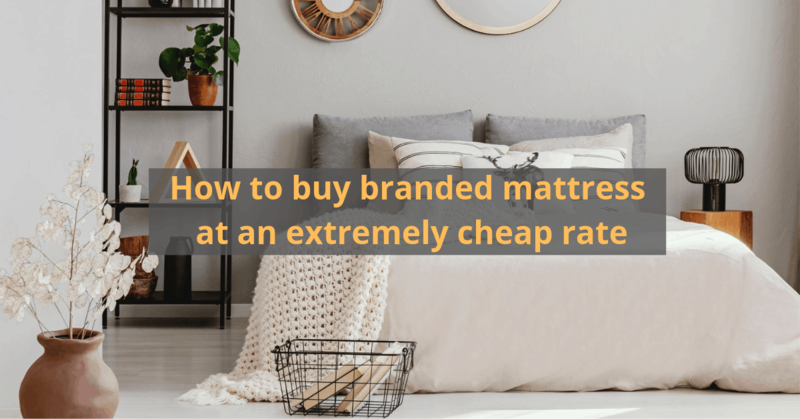 Therefore, we have created a guide for you to get a bang for your buck when purchasing premium mattresses – one that can last a decade or more and is worth your every penny. In the past, many mattress retailers have seen to numerous tactical buyers taking down their desired mattress models to compare prices with online stores. This has hence led to endless give-ins to price haggles to match the rates online. Thus, to gear up the competitiveness in the industry, all mattress stores (retail and online) have jumped on the “name game” bandwagon. In other words, mattresses that have similar or exactly the same features are named and priced differently to prevent a direct price comparison. This is why the industry has long been known for their marketing stunts and unreasonably inflated prices that cause consumers to overpay. Mattress stores want to rip you off. Here’s how to fight back. Now that you’re aware of this, it’s time to see how you can avoid falling into the trap. Since mattress stores make price unnecessarily difficult and tedious to compare, one way to tackle this is to look out for charts online that tell you which mattress models are identical. Another way is to directly compare the features and specifications of each model. If they are not readily available, request for the information from the staff. The basic sizes available are king, queen, single and super single. Be sure to think about things like space constraints in the bedroom, number of people sharing the bed and growth if you’re purchasing it for a child. To determine the most comfortable firmness level for yourself, it is recommended that you lie on each bed for about 15 minutes to see if you are satisfied. Once you’re sure, inform the store staff of your preference and carry on your search from there. Always check the return policy of the store. While lying on the mattress for 15 minutes may give you a rather good gauge of the comfort level, it is not a fool proof way of confirming it. Also, longer warranties may indicate high quality, but it does not necessarily have to be longer than 10 years since mattresses are advised to be changed every decade. The suitable firmness level is also dependent on your typical sleeping position. Side sleepers should be looking for something that is 3-6/10 in firmness, in order for the bedding to be able to outline the curves of their bodies. Any mattress that is firmer than that will result in body aches from the lack of support. Back sleepers need mattresses within the 4-7/10 range, which will offer an ideal amount of support to prevent back problems while being soft enough to eliminate pressure points. Stomach sleepers should focus on getting an equal amount of support throughout the entire body. A mattress with a 5-7/10 firmness would prevent lower back pains and curving of the spine. Top 3 premium mattress brands and how much do they cost typically? Simmons’s long-standing history and global impact on the mattress industry have vastly contributed to its premium branding. Established in collaboration with top orthopaedic surgeons in the 1950s, Sealy quickly became one of the largest bedding names. TEMPUR has developed a one-of-a-kind open cell structure in its bedding to ensure uninterrupted, quality sleep. It is ranked number 1 for overall customer satisfaction and overall quality of sleep in 13 European countries. *Price comparison is done based on the information that is available online and is only an estimate for visualisation purposes. *Prices are based on a king size mattress of medium firm level. If you are making your purchase on Amazon, be sure to change the delivery address to a US address first before browsing. Otherwise, you will not be able to see the full list of mattresses available because Amazon retailers do not ship to Singapore. You can arrange with your freight forwarder to get a US warehouse address for the mattress to be delivered to later! Some US stores do not provide the option of shipping internationally. Even if they do, it will be expensive for them to ship internationally and the costs will be passed on to consumers. Some stores may do international shipping but not door-to-door shipping. This means that you will have to engage a local mover to transport your mattress from the shipping port to your home – it may be a logistical nightmare to settle on your own without much shipping expertise. A professional freight forwarder will settle the paper work, import and export licence and cargo insurance on your behalf. It would be ideal to find a freight forwarder that has had experience in completing similar mattress shipments for their customers. The shipping cost ranges from $600 – $1200 for a queen/king size mattress to be shipped from US to Singapore. Note that these are the information you need to provide the freight forwarder. Typically, it will take about 30 – 55 days for sea freight. Getting the perfect mattress is vital to getting the deep sleep you need to recharge for the following day. That is why many are willing to go for premium branded mattresses – after all, 8 hours a day translates to spending about 1/3 of your entire life in bed. Let us know what other mattress shopping hacks you have in the comments section below! Copyright © 2018 M&P International Freights Pte Ltd. All rights reserved.